Real, heartfelt connection is what most of us crave in marriage. And yet, the hustle of everyday life can easily squeeze out that much-needed connection time. How are we supposed to maintain a strong marriage when our days are overloaded with well-intended activities? I’m convinced it doesn’t take a lot. In fact, I know that one intentional habit has kept our marriage thriving even in the busiest seasons. It’s not much. Just 15 minutes, once a day. Here’s a glimpse into this incredibly simple (but powerful!) habit, and ideas on how you can easily add this habit into your marriage. It’s 5:00 p.m., and from my kitchen window, I can see the sun is setting. We each grab a small snack and walk outside to our backyard porch swing. It has become our favorite place to spend our daily check-ins—those 15 minutes we spend everyday that keeps our friendship close and our marriage strong. And while the kids and I also love to snuggle up and read stories before nap time here, I like to think that the swing is happiest when it’s holding my husband and I. While I would love to tell you that all our conversations are deep and thought-provoking, that would simply not be true. Most days they’re simple glimpses into everyday family life: daily reports about how the kids are doing in school, upcoming events for the week, frustrations with work… that sort of thing. And other times we just collapse into the swing exhausted, its gentle swaying a soothing balm for two people who overcommit, make mistakes and need rest from a busy life. Sometimes we dream—about places we want to travel to, things we want to do with the kids—or we spend time in prayer as we connect with our Heavenly Father. But always we’re holding hands and staring into the distance. That to me is the best part of all. And I can’t tell you how this simple daily habit continually makes a profound difference in our marriage! Why does our “daily check-in” make such a difference? First, it reminds my husband and I to stop—to look around us and remember that that there’s a deeper foundation for the sometimes overwhelming chaos of daily family activities. Our marriage is that core place where our family begins and ends. These daily check-ins remind us that if we don’t nurture this most critical aspect, our entire family structure will begin to break apart. Second, it is an important release of the everyday emotions and thoughts swirling around inside us. I’m often the talker and my husband is the listener (it’s just that way since he’s a more introverted guy) and I often feel my stress melting away as we bounce ideas off each other and ground each other in biblical truth. Together we work to untangle the complicated feelings that can easily lead our family decisions down the wrong path, and we strategize together as we look at the big-picture-goal of serving God as a family. Our daily check-in isn’t always on our porch swing, of course (my husband travels, and somedays I have afternoon commitments with the kids), and it’s not always at 5:00 p.m.
And that’s my point. You don’t need a porch swing. And the time of day doesn’t matter. You just need a commitment to make this daily connection happen. Connect each day for at least 15 minutes in some way with your spouse, whether that’s driving together somewhere, chatting on FaceTime (if one of you is out of town), or even talking while making dinner together. It’s a wonderful investment in your marriage that will keep your relationship vibrant and your friendship close. Give it a try for several weeks and notice the changes! Do you have a daily check-in with your spouse? 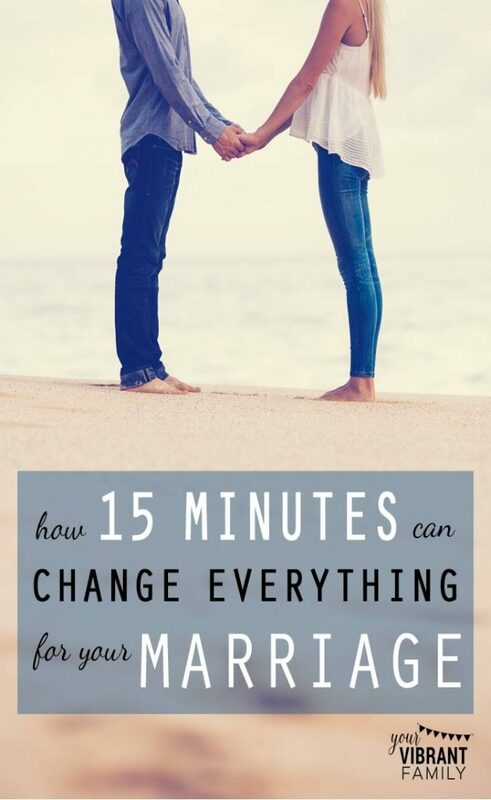 If not, how could a 15-minute check in change your marriage for the better? This week, I pray you’d begin the daily habit of these simple-but-powerful moments with your spouse! It’s a beautiful way to invest in your family and to grow closer as a couple! And don’t forget to download the free printable! I want to encourage you in your marriage, and not only help you adopt this habit, but teach you about 4 other incredibly powerful habits that can transform a marriage! You don’t want to miss this free teaching. It’s my gift to you! Did this post encourage you? Please pin and share it so that others can be blessed too!